Since 1988, we at Memory Vision have been providing comfort and strength to families through our memorial videos. To get started scroll down, or Click Here. Funerals are all about memories. 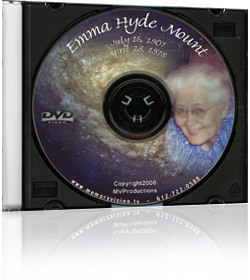 Having a memorial video playing at a funeral or memorial service is a tremendous reminder of the life of the deceased. Instead of focusing on one's loss, it is a reminder of a legacy of memories. Memories are the greatest possession we have, and a funeral video reminds us of our wealth. We at Memory Vision have been producing funeral videos since 1988, and these videos continue to be a source of comfort and strength. Each video is highly personalized and presented with movement in the photos and timing to the music. Each photo is processed in such a way that old photos become new and faded photos become vibrant. We can even provide reprints of photos. Below is an example of our funeral video work. To listen to what a funeral director has to say about the value of tribute videos. To listen to what a funeral director has to say about our funeral video services. Our basic program includes 30 photos and begins at $179.00. Based in Minneapolis, we offer nationwide service and promise to produce the video within 24 hours of receiving your photographs. Take time to look at our short demo. If you would like to see the entire demo, please contact us and we will be glad to send you a copy. Please contact me about getting photos to you. I'm ready to create a video and want to email my pictures to you.